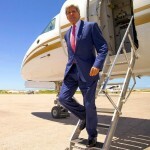 John Kerry became the first U.S. secretary of state to visit Somalia, when he landed early Tuesday in the war-torn nation on the Horn of Africa. Kerry landed in Mogadishu and was scheduled to remain in the heavily fortified airport while meeting with the country’s leaders, President Hassan Sheikh Mohamud and Prime Minister Omar Abdirashid Ali Sharmake. “I think it will send a strong signal to [terror group al} Shabaab that we are not turning our backs on the Somali people and that we will continue to engage with Somalia until we bring Shabaab’s terror to an end,” said a State Department official. Read more at The Guardian.